You can do that. You can also wear the oil on yourself when you are around your crush. Have a little bit on your hands so it comes into contact with your crush when you touch them. Thank you for your suggestion. I have actually dab some oil on the postcard that im going to send him. Is that okay? I have sent the postcard justnow. My crush has received the postcard which i dabbed on the Attraction oil but he didn't show any sort of interest or so towards me. Lol. I would back this up with spell work. Thanks Miss Aida for the suggestion. I will try to incorporate that. Hello, i had a question. I am new to this forum, so i appreciate the help! College will be starting in september. I am looking to fall into a relationship. Meaning girlfriend. I want to have a girlfreind that i can love, and love back. The product "follow me girl", my understanding is that it attracts the females. What im looking is that i attract females toward me at college, then i can choose one to have as a girlfreind. So basically i want all the attention and the girls wanting me. I am in search for the one girlfriend tho, from all this. Also "look me over", sounds good. if someone can please enlighten me , would be awesome. Also do i wear this as a cologne? like on arm, wrist? And here's an array of spells that Miss cat wrote. They are awesome! Just an addendum; Look Me Over doesn't work for getting attention from women. Hello all, I am new here and just found out about LM a few days ago. I have just now started buying Hoodoo oils, and you all seem to have great products that give really good results. Two that got my attention were Follow me boy, and Attraction oil. I am currently trying to attract more male attention, It seems that no matter what I do I cant seem to get a guy (who is my age) to even be friends with me. I do get male attention, but its always WAY older men, or a guy whos just looking for a girl who can boost his self esteem. I really wanted to try the follow me boy oil, but due to the lack of male friends, and having no boyfriend experience I thought I wouldn't know how to handle that sort of attention, so i ended up buying the attraction oil. It seems right up my alley, and all the benefits that comes with it. In the long run I do want to find a mate, but a few friendships wouldnt hurt! Is that bad? Also more money from my job would be amazing. Then i could buy more oils lol. And, NO, it's NOT bad! Wowza, Ms Aida! Did I do something to offend you? I just saw the response to my post from August & it read as a bit harsh. Okay, just want to share something about this oil. I gave been using it for quite sometime now. One of my housemates was actually consulted her uncle and he sensed something bad exist in this house. He even said rhst someone is using attraction oil, which is easier to attract the demons to come in. She is a Muslim. She said it's a taboo in their practices. So, what should i do? This is a Hoodoo Forum and I can't speak for religions, their beliefs, and their practices. In Hoodoo, it obviously doesn't attract demons. And this is not the intent of the formula. So, whether you use it or not will be up to you. You live there and this is a decision that you have to make alone. Dont get me wrong. Im not blaming the oil or so. Im just surprised that she will actually do that. By the way, im in the midst of searching a better room to stay. So, i wont be interfered. I will keep on using this oil though. By no means i will use this oil to attract bad things to come towards me. I was just felt weird why she will think the oil is actually attracting evil things to come. Or maybe there were bad spirits in this house that i didnt aware of. I personally think she was intimidated as she said " you're not like us, for us using this oil is bad, blah blah blah"..maybe it is a sign that i should move out as well? Whether you choose to move at all, or continue to use the Attraction oil, is entirely up to you. But I think you have gotten good advice here on the nature of that oil, and how it does not attract bad entities to you. I hope that gives you a little comfort in all of your decision-making. Thank you for your input. I'm glad for the response. I just wanted to comeback and post my results about the oil. I've had it for over a week now, and when i first tried it, i didn't really notice that much of a difference, but then I read the post regarding the wait three days , and I can say that it indeed DOES work. This week I was low on funds, and was dreading it because I would have to make my money stretch into next paycheck (which is only a few days) so I wanted to buy a few things to eat for the week. The store i work usually has high prices so i was going to stock up on instant ramen. What about when I got to work the manager through us a huge pizza party. Im not sure if this was a coincidence, but I didn't have to buy anything that day. I had pizza for lunch, and there was even some I was able to take home for me and my brother! During the same day I got a free two dollar coupon, and everyone was just generally nicer? Also I noticed that alot of things i liked were on sale for LOW LOW prices, Im talking like a gourmet flatbread pizza for 50 cent? (" usually around 5 to 6 dollars) It was awesome! The only weird thing that happened to me the other night though was this weird customer. It was around 8:30 when a pregnant woman and her mother came into the store to shop. The thing was that this customer kept walking past me every 5 to 10 minutes, and it freaked me out. I thought they might have been stealing, but im not too sure. It was so weird that even another customer came up to me to ask did I know the girl? ( The pregnant woman) The customer told me that as i passed the girl she stopped, and gave me the stare down while my back was turned. So in my head I was thinking. "oook so this isn't my gut." I prepared for the worst, because if she was going to try anything I was certainly about to lose my job that night. So a few hours past and its about 10:45pm the store closes at 11:00pm They were still in the store! They had been in the store for roughly 2 whole hours. So i make the announcements that the store would be closing, and they finally come out of nowhere. Since I was managing self checkout they had no choice but to come there. While trying to pay for their things, the mother had no idea what she was doing, so i reluctantly had to come over and help. I didn't even look at the woman. So after ringing up there things I acted nicely like i was suppose to then walked away, but still watching them from my station. The mother realizes she couldn't pay for the things and left the store, so the woman asks me to take everything off but a cupcake. So i did, and rung up the stuff, she had to approach me to get her money, so I thought i would say something nice, as she gets her money i say. " Your nails are pretty." and then she responds in a deep voice while snatching the money from my hand. " and you're cute." The pregnant woman, wasn't a woman at all.. it was a man! As she walked out the store I was dumbfounded. I don't know why, but I immediately thought about the attraction oil, and how one user said it attracted some envious looks. I admit the whole situation was quite amusing to deal with, but i just hope it never happens again. I definitely recommend this oil, and i will be buying more oils VERY SOON. 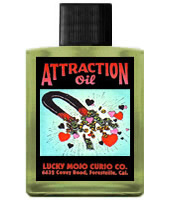 Yes, the Attraction oil is indeed very powerful and can attract all kinds of things, including envy if that is indeed what happened with that "pregnant" man! Interesting experiences, thank you for sharing. I need some advice. I have attraction oil, and I was wondering what I could use to compliment it. I'm a male who's interested in exploring my sexuality - I want to attract a masculine male who's willing to experiment (bromance). I'm not interested in feminine men. Are there any herbs, or oils that I could use to compliment this oil? Maybe Sampson Snake Root? You could add some Q oil and petition to attract just that kind of man. Sampson Snake Root can help you gain respect from others, which can help you draw in the right kind of man. This is some powerful oil. I received a bottle last night. I plan to anoint a pink candle for a love spell with it during the next waxing cycle. I dabbed some on myself last night, I loved the smell. But didn't specify what I wanted, I was just enjoying the smell. I don't know if this would qualify as an 'attraction' event but I had a dream that gave me an answer to a question that has plagued me for months. I didn't write it off as coincidence, but I thought it was interesting. This morning I dabbed some more on, but this time I put intent behind it. I'm looking for new love, not trying to attract any one particular person. But it seems to attract a lot of stuff my way. I walked out of my building this morning and this man was walking by and started talking to me. It wasn't a flirtatious conversation, it was friendly. But he was very nice. No one talks to anyone at 6:30 am in the morning in my neighborhood. We're all tired. But he was chipper and chatty. I go to get lunch today and the lady behind the counter gave me extra chicken (I know it is silly, but it is something I noticed that is out of the ordinary). As I walked back into my office building this man says Hello to me. I don't know him, never seen him before, doesn't work in my building either. I am thrilled to see this is so potent. Now for my question. I was planning to dress a pink candle with this to do a basic love attraction spell. I was considering the entire kit, but am not sure if that kit is appropriate for my purpose as I'm not trying to attract a certain individual. Will the attraction kit work for my needs? Or is there another kit that is more appropriate? The Attraction spell kit would be appropriate for you. It has everything you need, plus full instructions. Just state your petition clearly that you wish to attract the perfect partner for a stable, loving relationship with you. Wonderful, thank you Miss Athena. I'm looking forward to sharing my results about the kit. Miss Athena wrote above that Attraction oil can attract all types of things, but does this also apply to information via dreams? I've always had pretty vivid dreams, but I've noticed on the nights I happen to use the oil for ritual purposes or whatever or on my mojo bag under my pillow, my dreams are not only vivid, but are brining me answers to questions/situations I have long needed answers to. I've not been using the oil for this purpose intentionally, but the answers I'm getting do relate to love (my intent). The first time it happened I thought it was interesting, but it has happened 3 times this week (I rec'd the oil last Monday). It only happened on the nights I used it. And, yes, this can happen. However, my thoughts are that you are exceptionally gifted psychically and you're attracting Spirituality also. Thanks for the reply Miss Aida. I am very pleased it is happening. Perhaps it is enhancing things. I suppose I shouldn't question the process!! Hi everyone! I decided to dab on some Attraction Oil today putting my intention prior to application. My intention is to attract my ex back to me. When I got on the subway platform this morning, my heart darn near stopped! I saw my ex in a distance on the same platform! I couldn't get to him with the subway coming into the station and the morning rush hour madness but I did text him. I wanted to see which car he got into, if it was next one over I would try to head over there to surprise him. I did not see how far he walked down and nor did he respond to my text. I am still in awe! I will continue to wear this oil because I do love the way it smells. I have a Return to Me vigil candle going, a honey jar and a talk to me candle spell going. I look forward to reporting more good news soon. Wish me luck! That is fantastic news! Sounds like you're off to a great start and I wish you the best of luck. Ok I don't know if I'm asking this in the right section but I'm looking for a strong attraction spell or oil for this guy that I really, really have strong feelings for and in about a month or two, we're going to be working on location, working on the same project together so I want him to feel attraction towards me, possibly strong attraction towards me. So, what can I use to have this done? A spell? Hoodoo doll? Oil? Powder? I finally got my attraction oil and come to me oil this week. I am still trying to learn how to use the oils so need guidance if I am doing something wrong. I used the same technique of using a pink candle engraving both mine and targets name with birthdays and commands. Last week I did this with vaginal fluids and actually got to sit and talk to target all day. But he didn't really seem interested in me and seemed awkward and fidgety. I then ran into target in elevator and asked how his day off was casually and that made him really nervous, I then sent him an email using our work email do I know he read it but didn't respond. So I left him alone all week, got my oils carved candle same way with both attraction and come to me oil but he's moving further away. His seat changed which means even on the one day a week we sat next to each other now we won't. I also have a blockbuster follow me and come to me candle burning with misc but don't know how proceed. The candle always burns calm and clear but I had a dream he was engaged to someone. It sure sounds like he ha someone else and is paranoid. You might want to get a reading on this to see exactly what is going on with him. I'm trying to get people who rsvp'ed maybe to come to an event as well as anyone else which might be new to the rsvp list. I am wondering here, should I use attraction, crown of success or influence, essense of bendover...etc...? Not sure which forumula I would want to use. There are over 20 people on the fence, which means there is a lot of interest but not much commitment. I also only want about 13-15 of those 20 to come. Right now I only have a handful committed. The event is in about a month and I was considering doing a run of candles to get more to come and keep them from dropping out. I would mix Attraction with Come to Me for this purpose...you want them to be amenable to the idea of coming to your event and then get them to physically move in your direction. A run of candles dressed in this fashion would be a good idea. bast78, I would also use cloves to represent the amount of people that you actually want to come, surrounding your candle. HI, I have the attraction oil, and I am trying to attract a friend to fall for me, I have a sketchbook I had bought him for his birthday. I was wondering if I can anoint the inside of the cover with attraction oil and what psalms prayer or command would I state? Would I also have to wear the attraction oil while anointing the book? Keep in mind that oils will permanently stain anything made of paper. So if the sketchbook has a cardboard cover, do not use those oils. Instead, you could very lightly dress it with Attraction sachet powder, stating your petition as you do so, and brushing off the extra. The prayer is just simple language like "So & so, come to me and be attracted to me, love me," that sort of thing. You could wear Attraction oil as you do that and when you're around this person. There is also tons of other spellwork you can do for love on this forum; just type "love" in the search bar at the top. for some reason the attraction oil isn't suiting my work. Everytime I use it something bad happens. For example lately at work my scores have suffered so i lit a candle attracting positive sales and friends. i engraved candle, dressed it then lit a candle. But the flame was soo weak and kept trying to extiniguish itself. So i stopped the spell and used another candle re did the work and the flame was nice and strong. but then a friend came over and moved the candle causing it to fall. i then relit it but after it had burned out there was a huge unburned chunk that somehow cracked the candle in half left over. the huge chunk had my writing to attract sales. So i guess this is a bust and i need to start again. But i find the attraction oil just doesn't like me. Is there another oil i can switch for it. I have the bewitching powder, look me over, follow me boy and kiss me oil. My come to me oil is all finished and only has herbs left in the bottle. I am having a hard time with everything at work and wanted to bring out some positivity here. Any advise? It almost sounds to me like a sign that your current work situation is a lost cause. What if you used your Attraction oil to bring in a better job? Most of your other products are pretty specifically romantically-oriented, but you could use Look Me Over to help draw attention to job applications you send out, or when you're meeting potential networking contacts. That's not good. Jealous people make me CRAZY! Then, perform the 13 day uncrossing bath. Follow this up with protection. And then follow this up with Crown of Success. My ex finally wants to meet up after our 4 month separation. I am doing a lot of candle burning for him to return to me. So for my question, should I anoint myself with attraction oil or any other oil prior to meeting up with him that may also trigger him to come back? I have come to me, return to me, reconciliation, fast luck, and love me oils. If i was you I would put reconciliation oil on my heart for his heart to want to reconcile with me. I would put attraction behind my ears for him to find me more and more attractive along with your personal fluid when he looks at you. I would put come to me on my elbows and arms from him to what to embrace me and come back. Just a little dab so every part of you is covering each aspect of your desire. Fast luck and be mixed in with all for you to receive your desired. That's just my thought, i am sure the professionals will have more suggestions for you. Any of the oils mentioned maybe used for dressing candles or worn on the body. That is very informative and helpful, I never looked at it that way. Thank you so much. You're awesome! I'm sorry for the confusion. I named the oils I had that I used to anoint the candles. My question is can I anoint myself with those oils so my ex will officially come back to me? For example, rubbing return to me oil on my arms before I see him to also add into my intentions of bringing him back. Will this be useful or would you recommend I do something else? The oils I already have are love me, come to me, return to me, fast luck, return to me, and reconciliation. How should I anoint myself with these oils before I meet with my ex, so he may return to me officially? Attraction Oil may be used for dressing candles, worn on the body, or used to prepare a scented bath. Hi I'm just wondering if the attraction oil can be used through long distance. I had Madame pamita cast a talk to me spell for my ex who lives states away from me. She recommended I use attraction oil which I have for about a week. So far no progress just yet. But, remember, spells awhile to work.